Nelson Mundell (@NelsonHistory), a current PhD researcher and secondary school educator, gives us the inside scoop on how to approach teachers for help with disseminating your research. Working with schools, teachers and pupils is a wonderful experience – it can be richly rewarding and, if you’re lucky, you may be able to influence whole generations of learners. However, it must be approached in the proper manner. Many of us will know a teacher, and their complaints about being overworked and having no free time are unfortunately all too true: there was always something I could have been doing. This is why any engagement with secondary schools, teachers and pupils must be thought through methodically. To start, I would suggest answering three key questions – would pupils enjoy this; will teachers find it useful; and is it relevant to the curriculum? We all think our own research is fascinating, and that enthusiasm can be invigorating and infectious, which can sometimes convince us that our ideas would appeal to anyone. However, like any engagement with the public, we need to put ourselves in the shoes of the audience: is molecular science going to be exciting for primary 3s; are the nuances of slave trade legalese going to interest S2s; will a critical examination of Gaelic place names grab sixth years? The answer is, of course, that they could be! The catalyst needed is a good teacher: someone that understands the curriculum and the targeted age group, someone who knows the different pedagogical techniques that could help turn your new research into practicable lessons and, crucially, someone that has the time and commitment to see the project through. Good teachers will work on your project if - it is useful; adds something new and relevant in content; and is practicable in their classroom. Many teachers will do this because it benefits their students, and need little motivation, but if you can secure some funds, even better. But it takes time – in the past I’ve organised workshops during the weekend or during their holidays, time they are giving up. Meeting on school days is almost always out, the run up to study leave is too busy, and there is usually still a practice exam period to be negotiated too. Image provided by Nelson Mundell. The image shows the twitter header picture for ‘Freedom Bound’ - a graphic novel produced using research about runaway slaves in Scotland. It is now disseminated throughout schools. The first two conditions are vital, and if they’re not met it’s time to head back to the drawing board and wonder if this is the right audience for you! However, this third question is the most important factor in whether your project will have long term impact. I have seen a few projects that have created great resources for schools but – having little relevancy to what is taught – have failed to take off outside one school. It is fairly easy to tailor a resource for one class in one school where a friend teaches: it is much harder to create a national resource that will be used across the board. This is mainly down to the constraints of the curriculum in secondary schools. On the face of it, the current educational framework – Curriculum for Excellence – gives great freedom to teachers, but this only applies in certain circumstances. S1-S3 (ages 12-15) are sitting what is called the Broad General Education, and S4-S6 (15-18) are in the Senior Phase, sitting certified courses. The level of content for these qualification is huge, and there is little room for lessons being given over to topic or content not absolutely integral to understanding the course. You can find out what the syllabus looks like for your subject by searching for it on Education Scotland’s website here. In the Broad General Education certain experiences and outcomes have to be met; in the Senior phase each course has specific modules to be covered and these are defined by the Scottish Qualifications Authority – search your subject here. Figuring out answers to the questions above will help your project get off to a good start, and additionally place less of the initial burden on the teacher – they are the crucial cog in making any school-based project work well. 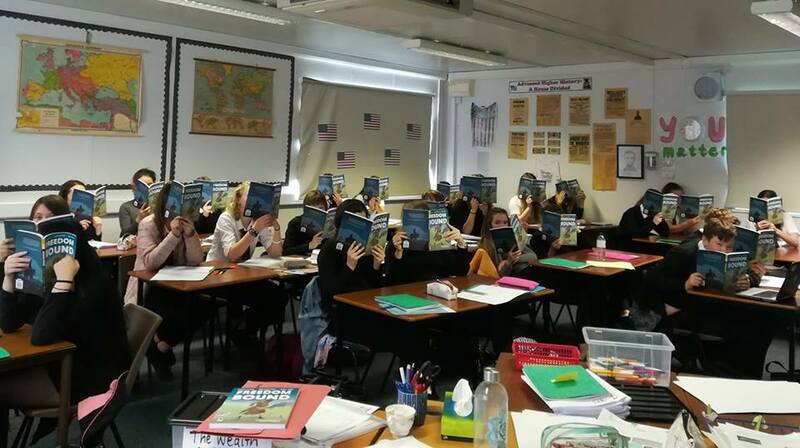 The image shows a classroom filled with students nestling their heads inside Nelson’s graphic novel Freedom Bound. Nelson Mundell (@NelsonHistory) is a PhD candidate in History, a current secondary school teacher, and has facilitated several projects linking the work of academics to that of teachers in schools. As part of the Runaway Slaves in 18th Century Britain project, he helped create Freedom Bound, a graphic novel based on facts uncovered about runaway enslaved people from Scotland. With the help of an ERSC grant, a class set has been supplied to every Scottish state secondary school, some 12k copies.